Bigger and more muscular than ever, but always manageable and agile. Just the way Scrambler intended. Because the 1100 is not just the most powerful Scrambler ever, thanks to the Monster’s engine; there’s also a lot of technology on board and a lot of work behind it. The seat is high and wide, comfortable for two; the pace is longer, the fork is increased and renewed, just like the tank, that is very capacious. But the cycling is the same one that made Scrambler a legend. And the borders of the Land of Joy can’t be seen anymore, not even on the horizon. ’62 YELLOW/SHINING BLACK: Two colours to express your personality in the best way. Black, for a more classic look; yellow, fot those who aren’t afraid of being noticed. DRL LED HEADLIGHT: The 1100 headlights are modern and contemporary; while recalling the typical Scrambler’s shape, they use a bright alogen source with LED lights. LCD DASHBOARD: The innovative LCD display has an essential and sporty look: all the informations are easily available and the additional element gives more insight on your ride. STEEL TANK WITH ALUMINIUM SIDE PANELS: The metal drop tank, is a crucial element to the entire design of the bike. 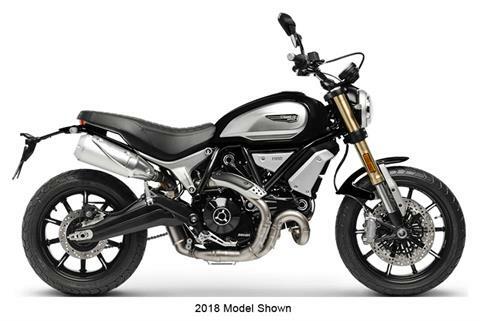 It has an unique style, that enhances the Scrambler 1100’s personality. MACHINE-FINISHED ALUMINIUM BELT COVERS: Sculpted in metal, the carter protects the clutch and adds another distinctive element to the bike’s design. UNDER-SEAT STORAGE COMPARTMENT WITH USB SOCKET: Even in its minimal look, you won’t miss any space. You will be able to put away the most important objects and charge your GPS or cellphone to be always connected, even on the road.